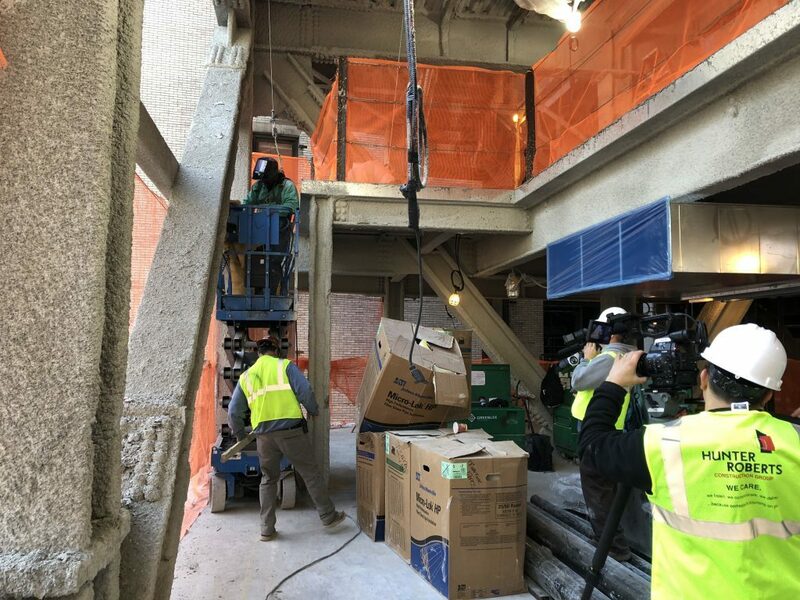 In the spring of 2018, we were shortlisted for an extensive project producing a construction safety video for Hunter Roberts Construction Group, a leading construction group specialized in complex projects including skyscrapers, hospitals, and even a park on the Hudson River. After being awarded the project, we knew we were in for something exhilarating. Hunter Roberts hired us to create a 5-Module comprehensive, employee-instructed, cinematic series on worker safety: something real, raw, and sleek. We wanted to make an all-encompassing construction safety video highlighting Hunter Roberts’ commitment to building a culture of workplace safety. First thing first was coming up with a concept. This was conceived in collaboration with Hunter Roberts’ marketing team. At the end of the day, the most important thing to them was that their contractors left the workplace in one piece to return home to their families. Promoting a safety culture that reached across all disciplines was key here. And being that Hunter Roberts is a lead contractor that hires dozens of subcontractors on a given project, from steel and iron workers to architects, they wanted something unifying and relatable. So, what better way to get across to a wide variety of employees than by hearing directly from the workers themselves? The personal touch, as they say. 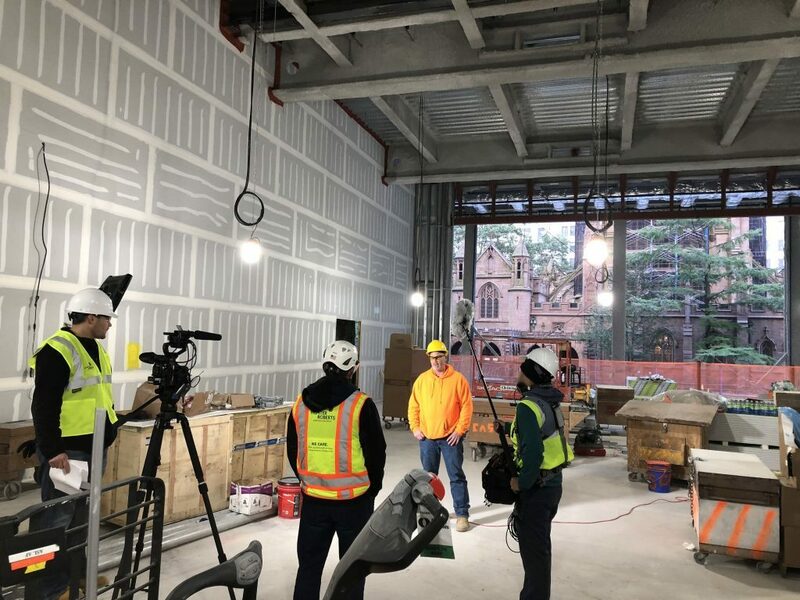 As the development process got under way, we began to organize how we would approach bringing HR’s vision of a construction safety video to life from a production angle. To get started, we needed first to determine what it was that they didn’t want to produce. We knew that we didn’t want to make a bland one or two camera production that just recited all the safety code regulations one after another. No talking heads. No stodgy graphics. Just an organic, approachable series that would encapsulate the safety culture that Hunter Roberts was looking to develop. They wanted to promote that being safe goes way beyond just personal safety. Safety is about looking out for your work team and having the integrity to do your job properly. Construction is a dynamic field and we wanted to capture that as best as we could by employing drones, gimbals, and steady-cams to capture the action the way it was meant to be seen. What we originally thought of as a five-day shoot we quickly decided would be better over the course of seven shoot days. This allowed us to scale down the size of our video crew and work around the hectic schedule of a busy construction company while still coming in on time and under budget. We pride ourselves on being adaptive to the work environment we’re shooting in, and working with a nimble, flexible crew. After finalizing the script with Hunter Roberts, we needed to develop a shot list that would contain the dynamic energy that we wanted to capture. With the length and number of videos we were putting together for HRCG we knew we needed a lot of footage, so we made sure to bring extra camera operators on each shoot to document every possible combination of safety dos and don’ts. We wanted to make sure we got all possible shots the first time around without missing anything. To best suit each site, we wanted a drone operator, gimbal operator, and a handheld camera rig to be nimble and film unique angles. While on site, our producers were in constant communication with their camera operators sure that we got all the all shots and that everyone was safe on our team as well as HRCG’s. We needed to look no further than the mirror to determine that we weren’t shooting in our usual element. Whenever you’re on set with a company who does a dangerous job, your video production crew must follow their lead, do what they do and dress how they dress. On day one when we arrived on set outfitted in boots, hard hats, high visibility vests, and protective eyewear, our production crew began to look more like a construction crew! From there, we began to live in the world that we shot in. Our shoots took place on piers, scaffolds, and skyscrapers, and we were prepared to handle everything that came with it. Construction work is dangerous, and to get the right shots, sometimes we had to put ourselves in tight corners, but just like the team at HRCG, safety always comes first. We were left with a sense of appreciation and respect for those we were filming and the hard work that they do. With our foray into construction came a whole new lexicon that became everyday lingo for us as we checked off our shot list from site to site. Group huddles started off everyday and were usually the jump off point for each day of shooting. 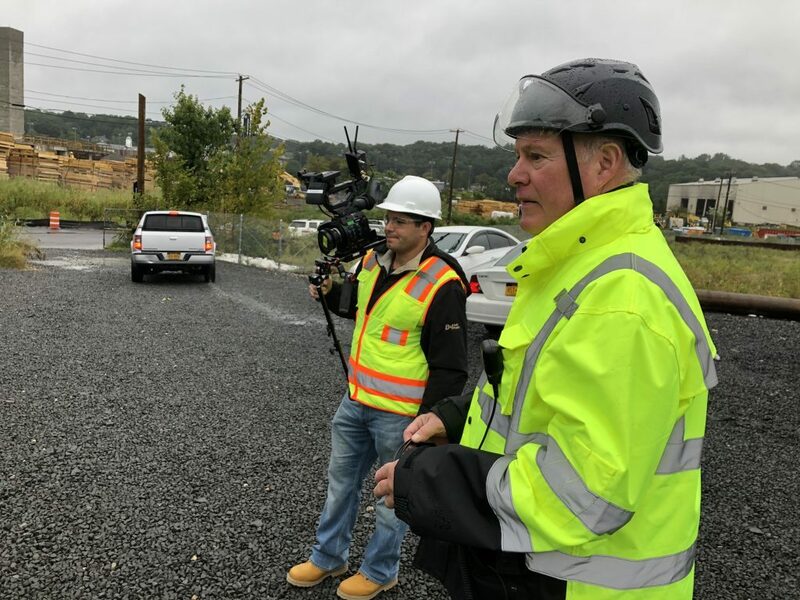 The sights and sounds of a team gathered before the day’s work was an essential scene for a corporate video focused on cementing a safety culture at Hunter Roberts. Proper Protective Equipment, better known as PPE, was a big one. Instead of just shooting everything, our crew had to be mindful of the safety regulations matching with the shots. So, that meant making sure all workers were outfitted properly in high visibility vests, tied boots, helmets, buckled buckles, and shielded helmets. When hotwork (burning, welding, or fire spark producing jobs) was being done, we needed to make sure our video crew was at a safe distance. Tie-downs were when a worker was on a beam or scaffold and needed to be harnessed in. Then there were the lifts, or elevators, which had to follow their own specific guidelines. By the end of our seven shoot days, we were talking like initiated members of the Hunter Roberts team. When we sign up to work on a construction safety video or training video, we take a certain responsibility and ownership in the message being delivered. Working alongside Hunter Roberts’ safety director definitely inspired us to be vigilant and thorough on our shoots. In our interviews with the workers, we directly learned the dangers present on the construction site. Horror stories aside, conveying an earnest, direct message to get everyone home safely became our focus. Working within these parameters, instead of running through tedious safety code after code, seemed a more impactful approach for this construction safety video and for everyone involved. Heading into post-production with heaps of footage is always thrilling. Working on a shoot of such scope entails a longer post-production process of voiceovers, edits, and re-edits. Due to the large scale of the project, the development process was six months. Over that course, we became close with our contacts over at Hunter Roberts which made the whole thing that much smoother on both sides. Building and maintaining relationships is vital to creating the best videos for our clients. Even a project as large and unprecedented as this one can feel manageable with efficient communication from the production team and client. Going into the editing room with terabytes worth of footage can definitely feel daunting, so it’s important to stay organized and have a plan from the beginning. To make things more manageable, our editors set to work organizing the video clips into categories: hotwork, marine work, aerial shots, etc. The convenience of having clean folders of organized footage made an extraordinary difference from the editing standpoint, allowing us to approach each module knowing exactly where the appropriate video content could be found. We couldn’t be more pleased with how the video has shaped up. But looking back, it was hearing from the workers themselves that helped capture Hunter Roberts’ message of a safety first culture and we’re proud to have played a role in bringing that story to life. Believe us when we say that our adrenaline is still kicking from some of those Hunter Roberts shoots and that we’re proud and excited of the work that’s been done. Construction safety videos don’t win Oscars or Emmys, but they can be extremely rewarding and even fun to work on if you approach them in a creative, open-minded manner and allow the project take you to places you never thought you’d go.